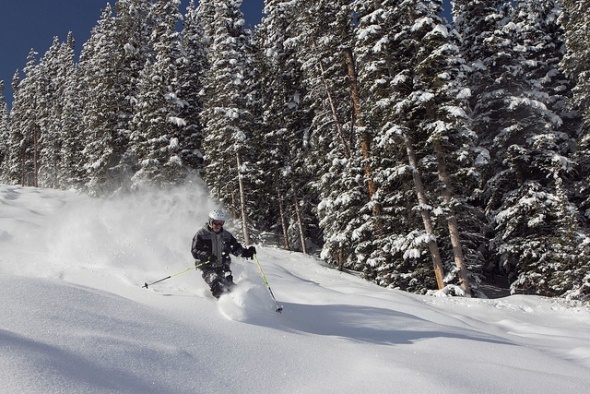 The Beaver Creek ski area has 1,815 acres of skiable terrain in two bowls on a mountain 13 miles west of the Vail Mountain ski resort. Both are owned and operated by Vail Resorts. Beaver Creek has a summit of 11,440 feet, rising 3,340 feet from a base at 8,100 feet above sea level. It gets an average of 325 inches of snow a year, with a ski season from mid-November to mid-April. There are 149 trails, with 19 percent rated as beginner, 43 percent intermediate and 38 percent expert or advanced, served by 25 lifts, including two gondolas, with a capacity of 34,000 passengers an hour. Beaver Creek is unusual in having its best beginner runs as well as its best-known expert run on opposite sides of the top of the mountain. There also are runs for first-timers at the bottom of the mountain. For beginners, the Red Buffalo, Mystic Island, Flat Tops, Piney and the other runs at the top of the mountain are recommended and offer panoramic views from the summit. Most of them are served by the Ride the Drink of Water lift. Beginners should watch the signs carefully, however, because expert runs are nearby. The Cinch run, essentially a cat track, takes beginners to the bottom. The Arrowhead Mountain section on the west side of Beaver Creek also has good runs for beginners. For intermediates, the Centennial run is the area’s longest at 2 3/4 miles and one of its most popular. Harrier is nearby and less crowded. Batchelor’s Gulch also is good for intermediates, with the Grubstake and Gunder’s runs on either side of the lift. Experts can test themselves on the double-diamond Birds of Prey trail that is featured in races for the annual Birds of Prey World Cup and is considered one of the world’s most difficult runs. Ripshaw and Cataract off the Rose Bowl lift also are demanding. For a different kind of challenge, head to the Stone Creek chutes nearby, which are short but have pitches of up to 45 degrees. Another favorite for experts is Grouse Mountain, which is covered with single- and double-diamond trails with bumps and glades. There are three terrain parks and a half pipe. Park 101, located off the Cinch Express lift, has small jumps, boxes, rails and stall features designed for beginners. The Boom Room, also at the top of the Cinch Express lift, has boxes, rails, log-slides, stall features and 20- to 30-foot jumps for intermediates. The Rodeo is a pro-sized terrain park for expert riders with both large and technical rails, boxes, stall features, log-slides, hips and 40- to 60-foot jumps. The Rodeo is located off the Continental Express lift, along with the expert-level Half Barrel Half Pipe, which is 400 feet long with 18-foot-high walls. Beaver Creek also has an area for cross-country skiing and snowshoeing in McCoy Park at the top of the Strawberry Park lift. There are 20 miles of groomed and rustic trails that start at 9,840 feet at the warming hut near the top of the lift to 10,400 feet at the highest point. There are trails for beginner, intermediate and expert Nordic skiers. The ski area has a half dozen restaurants on the mountain, half of which require reservations. Beaver Creek opened in 1980 on a mountain outside the small towns of Avon and Edwards. Vail Resorts developed the neighboring community in an upscale European style of architecture; the company also owns Vail, Breckenridge and Keystone.